To prepare for the lift the crew spent a week doing a lot of digging and grunt work under the house, and making stacks of timbers called "cribbing." Three big steel I-beams will rest on these cribbing piles. While the house is being lifted there will be guys down there building up the stacks with more timbers as it goes up. Then the house will sit on the beams and cribbing piles until the new foundation is in place. In the first couple pictures you can see the kitchen addition sticking out at the back of the house. The basement does not yet extend under it, but it will. We are also going to add another first floor room in the vacant area to the left of the kitchen, which will make the house rectangular again. The basement will be enlarged to extend under this whole area, all the way to the outside wall. 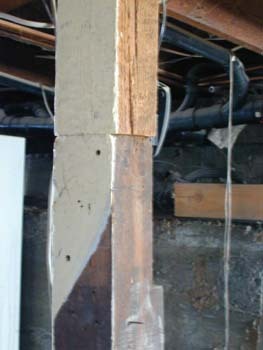 A brief tribute to the innovative stacked-post construction approach of the previous owners. We figure this house was lifted before, probably around World War II and probably as a do-it-yourself project. Evidence of good old Yankee know-how was everywhere. The insides of the basement walls were covered in places with various materials, including linoleum scraps and two halves of an old door. Waste not, want not. Why use a long post to hold up the house when you've got two short ones lying around, they must have thought. 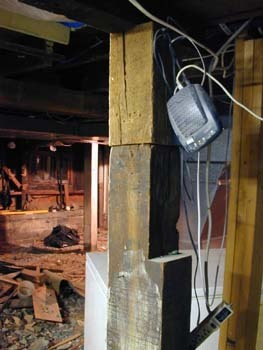 Anyway, the house stood on these wonky posts for at least 50 years and survived several earthquakes. Also, a salute to the durability of the Cisco 675 DSL modem shown at the right. The 675 withstood basement demolition without a hiccup, and was mercifully moved upstairs after these pictures were taken. It now resides comfortably in the new basement office and still works perfectly. The old furnace still worked great, but we knew we would have to replace it because it needed a chimney, which had to be removed to make room for stairways. So my wife put the furnace up for sale on EBay and it sold for $200 in a couple of days. She specified local pickup only, and some guy came and got it. Should give him a few more years of trouble-free heating. I was skeptical of the idea of selling something like that on EBay, but it worked out great for us and the buyer. You never know until you try.